Recently, active pharmaceutical ingredients (APIs) have been dramatically expanding from low-molecular weight drugs to peptides, proteins, antibodies, genes, oligonucleotides, cells, and machines. Therefore to develop pharmaceutical technologies and drug delivery systems (DDS) for these APIs, advanced molecules and novel concepts are needed. In this review, we introduce cyclodextrin-based supramolecular accessories such as molecular necklace, molecular earring, and intelligent molecular necklace, and describe their application for pharmaceutical technology and DDS. In addition, we also introduce utility of supramolecular accessories as antitumor drugs. Finally, we propose a new concept in pharmaceutical sciences termed as “supramolecular pharmaceutical sciences,” which combines pharmaceutical sciences and supramolecular chemistry. This concept could be useful for developing new ideas, methods, hypotheses, strategies, materials, and mechanisms in pharmaceutical sciences. A person may choose to wear an accessory so as to enhance their appearance and give them confidence and thus a change of character. So what happens when accessories are decorated with drugs? The author has developed molecular accessories for drugs through supramolecular chemistry to create new medicines and pharmaceutical technologies. In this article, the author introduces cyclodextrin-based supramolecular accessories such as molecular necklace, molecular earring, and intelligent molecular necklace, and describes their application in pharmaceutical sciences. Moreover, the author proposes a new concept in pharmaceutical sciences termed as “supramolecular pharmaceutical sciences,” which combines pharmaceutical sciences and supramolecular chemistry. Bilayer membranes formed by phospholipids vary in their membrane states by undergoing phase transitions in response to various external environmental factors. Pressure is one of these important environmental factors, but there are very few studies on the effects of pressure on phospholipid bilayer membranes. It is possible to deepen our understanding of the membrane states of phospholipid bilayer membranes by combining information regarding temperature- and/or ligand-responsivity with that regarding pressure-responsivity. In this review, we thermodynamically characterize the bilayer phase transitions of three kinds of saturated glycerophospholipids, each with a different polar head group (phosphatidyl-ethanolamine (PE), -choline (PC) or -glycerol (PG)), and explain their various membrane states depending on temperature and pressure. 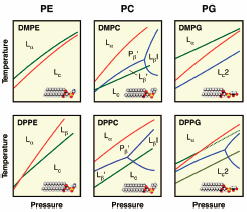 Both temperature- and pressure-responsivity reveal inherent features of these bilayer membranes: the metastability of the gel phase for PE bilayer membranes, the polymorphism of the gel phases for PC bilayer membranes and morphological changes in bilayer aggregates for PG bilayer membranes. Lipid bilayer membranes are soft, fluid, and dynamic architecture where molecules are constantly moving and thermally fluctuating under physiological conditions. In this review, a strategy to quantify molecular dynamics in membranes is introduced by utilizing solution-state NMR spectroscopy as a versatile, noninvasive technique. The dynamics involves lateral diffusion and protrusion motion, in parallel and vertical direction to the membrane surface. Dynamical behavior of small-sized drugs, chemicals, and peptides is also reviewed in relation to the lipid movements in membranes, on the basis of recent multinuclear NMR in combination with the pulsed field gradient technique. Finally, in-cell NMR method is introduced as a promising technique to capture drug transport processes in real time, to shed light on mechanisms of deliveries to living cells without perturbation of the system. The bilayer structure of biomembranes consists of thousands of lipids, the composition of which is different for each organelle. Since most lipids are synthesized in the endoplasmic reticulum, subsequent distribution to each organelle determines the composition and function of the biomembranes. Thus, interbilayer transfer and transbilayer movement (flip-flop) of phospholipids play important roles in maintaining homeostasis. A crucial task in biophysics and cell biology is to understand how rapidly lipids migrate between bilayers spontaneously or through proteins and to control these lipid dynamics. Time-resolved small-angle neutron scattering (TR-SANS) is a powerful technique to determine the intervesicular exchange and flip-flop rates of lipids in situ and real time. In this review, I explain how TR-SANS detects the interbilayer and transbilayer transfer of phospholipids and introduce recent progress of my group on the evaluation of spontaneous and protein- (or peptide-)mediated lipid transfer in several phospholipid dispersion systems. The structures of many membrane proteins have been analyzed in detergent micelles. However, the environment of detergent micelles differs somewhat from that of the lipid bilayer, where membrane proteins exhibit physiological functions. Therefore, a more membrane-like environment has been awaited for structural analysis of membrane proteins. Nanodiscs are “hockey-puck”-shaped lipid bilayer particles that distribute in a monodispersed manner in aqueous solution. We review how nanodiscs or protein-reconstituted nanodiscs are prepared and how they are utilized to analyze protein structure, dynamics, and interactions with lipid molecules using solution NMR and cryo-electron microscopy. Δ9-Fatty acid desaturase (Δ9-desaturase) is a rate-limiting enzyme of unsaturated fatty acid biosynthesis in animal cells and specifically introduces a cis-double bond at the Δ9-position of acyl-CoA. Since the chemical structure of fatty acids determines the physicochemical properties of cellular membrane and modulates a broad range of cellular functions, double bond introduction into a fatty acid by Δ9-desaturase should be specifically carried out. Reported crystal structures of stearoyl-CoA desaturase (SCD)1, one of the most studied Δ9-desaturases, have revealed the mechanism underlying the determination of substrate preference, as well as the position (Δ9) and conformation (cis) of double bond introduction. The crystal structures of SCD1 have also provided insights into the function of other Δ9-desaturases, including Drosophila homologs. Moreover, the amino-terminal sequences of Δ9-desaturases are shown to have unique roles in protein degradation. In this review, we introduce recent advances in the understanding of the function and regulation of Δ9-desaturase from the standpoint of protein structure. Biliary lipids consist mainly of bile salts, phospholipids and cholesterol, which form mixed micelles and vesicles. Bile salts play various physiological roles but have damaging effects on cell membranes due to their detergent properties. The cytotoxicity of bile salts on hepatocytes leads to liver injuries and is largely determined by the bile salt species, the concentrations of bile salts, phospholipids and cholesterol, and the lipid composition of cell membranes. In bile, monomers and simple micelles of bile salts coexist with mixed micelles and vesicles in dynamic equilibrium, and contribute to the cytotoxicity on hepatocytes. The ATP-binding cassette (ABC) transporter family members, ABCB11, ABCB4 and ABCG5/ABCG8, mediate the biliary secretion of bile salts, phospholipids and cholesterol, respectively. Mutations in ABCB4 result in severe cholestatic diseases, and the biliary phospholipids are necessary for the attenuation of bile salt cytotoxicity. On the other hand, cholesterol reverses the cytoprotective effects of phospholipids against bile salts. In addition, phosphatidylethanolamine N-methyltransferase increases the cell resistance to bile salts by changing the phospholipid composition and structures of the apical membranes. In this review, we focus on the molecular mechanisms for the protection of hepatocytes against bile salt cytotoxicity. Further understanding of these mechanisms will help to develop new therapeutic strategies for cholestatic liver diseases. Type III secretion system (T3SS) is a protein injection nano-machine consisting of syringe and needle-like structure spanning bacterial inner and outer membranes. Bacteria insert the tip of T3SS needle to host cell membranes, and deliver effector proteins directly into host cells via T3SS to prime the host cell environment for infection. Thus inhibition of T3SS would be a potent strategy for suppressing bacterial infection. We previously demonstrated that T3SS needle rotates by proton-motive force (PMF) with the same mechanism as two evolutionally related rotary protein motors, flagellum and ATP synthase (FASEB J., 27, 2013, Ohgita et al.). Inhibition of needle rotation resulted in suppression of effector secretion, indicating the requirement of needle rotation for effector export. Simulation analysis of protein export by the T3SS needle suggests the importance of a hydrophobic helical groove formed by the conserved aromatic residue in the needle components. Based on these results, we have proposed a novel model of protein export by the T3SS needle, in which effector proteins are exported by PMF-dependent needle rotation oppositely to the hydrophobic helical groove in the needle. Quantitative examinations of the correlation between the speeds of T3SS rotation and the amount of effector export support this model. In this review, we summarize our current understanding of T3SS, and discuss our novel model of the protein export mechanism of T3SS based on the needle rotation. Based on the “cluster effect” and the structure characters of acetylcholinesterase (AChE; EC 3.1.1.7), a new series of 1,2,4-triazolin-3-one and phthalimide heterodimers were designed, synthesized, and evaluated as potent dual acetylcholinesterase inhibitors (AChEIs). Most of the synthesized compounds showed good in vitro inhibitory activities towards both Drosophila melanogaster acetylcholinesterase (DmAChE) and Musca domestica acetylcholinesterase (MdAChE). Among them, 5g was found to be the most potent anti-AChE derivate (5g, IC50 = 8.07 µM to DmAChE, IC50 = 32.24 µM to MdAChE). It was 2.31- and 1.35-fold more active than the positive control ethion (CP, IC50 = 18.62 µM to DmAChE, IC50 = 43.56 µM to MdAChE). The docking model study revealed that 5g possessed the fitted spatial structure and bound to the central pocket and peripheral site of DmAChE. Moreover, most compounds demonstrated high insecticidal activity to Lipaphis erysimi and Tetranychus cinnabarinus at the concentration of 300 mg/L. A series of semicarbazone derivatives bearing phenyl moiety were synthesized and evaluated for the vitro anticancer activities in four human cancer cell lines (human colon cancer (HT29), human neuro-blastoma (SK-N-SH), human breast cancer (MDA-MB-231), and human gastric cancer (MKN45)). Biological evaluation led to the identification of 11q and 11s, which showed excellent anticancer activities against tested cancer cell lines with IC50 values ranging from 0.32 to 1.57 µM, respectively, while exhibiting weak cytotoxicity on the normal cells (human umbilical vein endothelial cell (HUVEC)). Flow cytometric assay for cell cycle and apoptosis revealed that 11q and 11s caused an arrest in the Sub-G1 cell cycle and inhibited proliferation of cancer cells by inducing apoptosis in a dose-dependent manner. Further enzymatic assay suggested that 11q and 11s could significantly activated procaspase-3 to caspase-3. Metabolic stability study indicated that 11q and 11s showed moderate stability in vitro in human and rat liver microsomes. In view of promising pharmacological activities of 11q and 11s, which had emerged as the valuable lead for further development in the treatment for cancer. 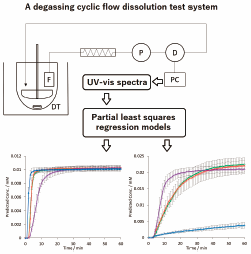 Dissolution kinetics of a bilayer direct compress tablet was evaluated by using degassing cyclic flow UV-visible (Vis) spectroscopy with chemometrics. The model bilayer nicotinamide (NA)–pyridoxine hydrochloride (PH) 100.0 mg tablets were prepared via the dual compress method. The fast diffusion layer of the bilayer tablet contained nicotinamide, microcrystal cellulose, beta-lactose, magnesium stearate, and croscarmellose sodium. The slow release layer contained pyridoxine hydrochloride and carnauba wax. The monolayer direct compress tablets were prepared as dual ingredient (API)s formulation tablets. The degassing cyclic flow UV-Vis spectroscopy dissolution test was carried out using the prepared tablets. The dissolution test conditions were as follows: time, 60 min; temperature, 37°C; paddle method, 50 rpm, and UV-Vis spectra measurement 1 time/min. The UV-Vis spectra of the flow solution were measured in the range of 240–380 nm. API concentration was predicted by partial least squares (PLS) regression models based on UV-Vis spectra. The dissolution kinetics of the bilayer and monolayer tablets were evaluated based on the UV-Vis spectra with the predicted API concentration profile. The degassing flow system could prevent air bubbles in the flow cell at 1800 min. Therefore, simultaneous determination of NA and PH concentration based on the PLS regression was suggested to have high accuracy. PLS regression has advantages over the conventional λmax absorbance method of simultaneous determination. We found that the kinetics of the separated bilayer tablet can be evaluated by the same kinetic analysis method used for the single layer model tablet. Formulation of a drug as liposomes facilitates its delivery to the disease target. Rightly, liposomes are gaining popularity in the medical field. In order for the drug to show efficacy, release of the encapsulated drug from the liposome at the target site is required. However, the release is affected by the permeability of the lipid bilayer of the liposome, and it is important to examine the effect of the surrounding environment on the permeability. In this study, we showed the usefulness of fluorescence analysis, especially fluorescence fingerprint, for a rapid and simple monitoring of release of an encapsulated anticancer drug (doxorubicin) from its liposomal formulation (DOXIL). Our result indicated that the release is accelerated by the existence of membrane permeable ions, such as tris(hydroxymethyl)aminomethane, and blood proteins like albumin. Hence, monitoring of doxorubicin release by fluorescence analysis is useful for the efficacy evaluation of DOXIL in a biomimetic environment. In order to maximize the effect of drugs, nanomedicines, drug-containing nanoparticles, have become popular in the field of medicine as they allow selective delivery of drugs to the disease target. It is important to understand the drug release form nanomedicine at the disease target. In this study, the authors developed a simple and easy method of monitoring drug release from nanomedicine using a fluorescence analysis, especially fluorescence fingerprint. 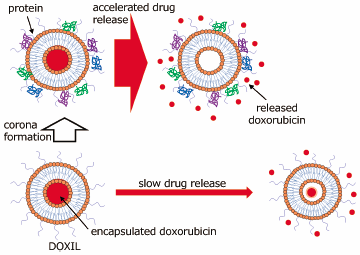 The authors used DOXIL as a typical nanomedicine and found out that the release of the encapsulated drug, doxorubicin, is accelerated by albumin which is the most abundant protein in the blood. A series of meta-amido bromophenol derivatives were designed and synthesized. The compounds were found to potently inhibit the growth of Mycobacterium tuberculosis H37Ra. They also exhibited moderate inhibitory activity against Mycobacterium tuberculosis H37Rv and multidrug-resistant strains. The compounds did not show inhibitory activity against normal Gram-positive and Gram-negative bacteria. 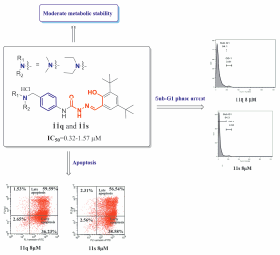 Moderate cytotoxicities and good metabolic stability were observed for the selected compounds. The results demonstrated meta-amido bromophenols as a new class of antitubercular agents with good potentials. As an important epigenetics related enzyme, protein arginine methyltransferase 5 (PRMT5) has been confirmed as an anticancer therapeutic target in recent years. Among all the reported PRMT5 inhibitors, two small molecules (GSK-3326595 and JNJ-64619178) are currently being assessed in clinical trial. In this study, 40 PRMT5 inhibitor candidates were purchased from SPECS database supplier according to the pharmacophore and molecular docking based virtual screening results. Alpha linked immunosorbent assay (LISA) methylation assay was performed to test their inhibitory activity against PRMT5. The in vitro enzymatic assay results indicated that four compounds (2, 4, 10 and 37) showed PRMT5 inhibitory activity, while 4 and 10 displayed the most potent activity with IC50 values of 8.1 ± 1.1 and 6.5 ± 0.6 µM, respectively. The inhibitory activity results of 20 extra analogs of 4 further confirmed the potency of this scaffold. 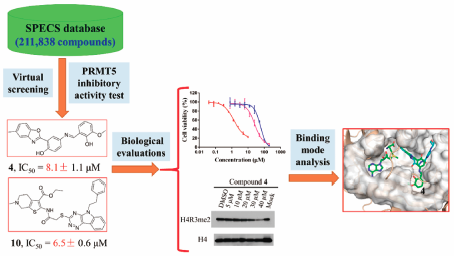 As expected, compounds 4 and 10 exhibited moderate anti-proliferative activity against mantle cell lymphoma Jeko-1 and leukemia cell MV4-11. Besides, Western blot assay results showed that 4 could reduce the H4R3me2s level in a dose-dependent manner, indicating that it could inhibit the activity of PRMT5 in cellular context. Detailed interactions between 4 and PRMT5 were characterized by binding mode analysis through molecular docking. The compounds discovered in this study will inspire medicinal chemists to further explore this series of PRMT5 inhibitors. In this study, we aimed to investigate the effects of stabilizers and processing parameters on the size reduction of alpha-mangostin (AMG) using high-pressure homogenization (HPH). The solubility of AMG in various stabilizers was studied. Selected stabilizers were used to prepare AMG suspensions by HPH under different conditions. After HPH, the particle size of AMG suspensions with stabilizers significantly decreased to microns. Percent size reduction efficiency of all AMG suspensions with each stabilizer increased with the increase in the number of homogenization cycles. Sodium lauryl sulfate and poloxamer188 provided a greater extent of particle size reduction than polyvinyl caprolactam–polyvinyl acetate–polyethylene glycol graft copolymer. AMG suspensions with binary stabilizers at higher pressure were also prepared. The use of high pressure increased percent size reduction efficiency. 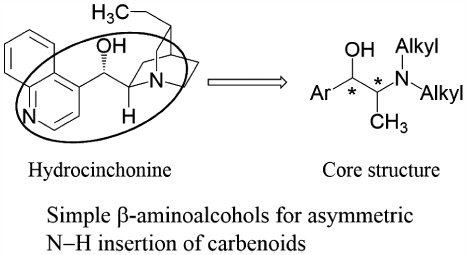 In order to develop an efficient organocatalyst for the enantioselective N–H insertion reaction via carbene/carbenoid, the catalytic core of the cinchona alkaloids was investigated. According to our working hypothesis of an eight-membered ring transition state in the N–H insertion reaction, two pairs of enantiomers related to 2-amino-1-phenylethanol were investigated for their chiral inducing potential. Since both (1R,2S)-isomers gave the N-phenyl-1-phenylglycine derivative enriched in the R-form, while their enantiomers gave the S-form, the 2-amino-1-phenylethanol structure is concluded to be the catalytic core of the cinchona alkaloid in the enantioselective N–H insertion reaction via rhodium(II) carbenoid.